Slovenia is almost 60% covered in forest, which comes in pretty handy when its this hot because you are never far away from some cool shade in the forest. So in the past few weeks, most of my trips have been planned around being outdoors and making the most of the fantastic weather, whilst also being in the shade. The Pokljuka Gorge (Pokljuška soteska) is a hidden and refreshing gem during the summer. A lot of people bypass it on their way to the Pokljuka plateau but it is certainly worth making the short detour. 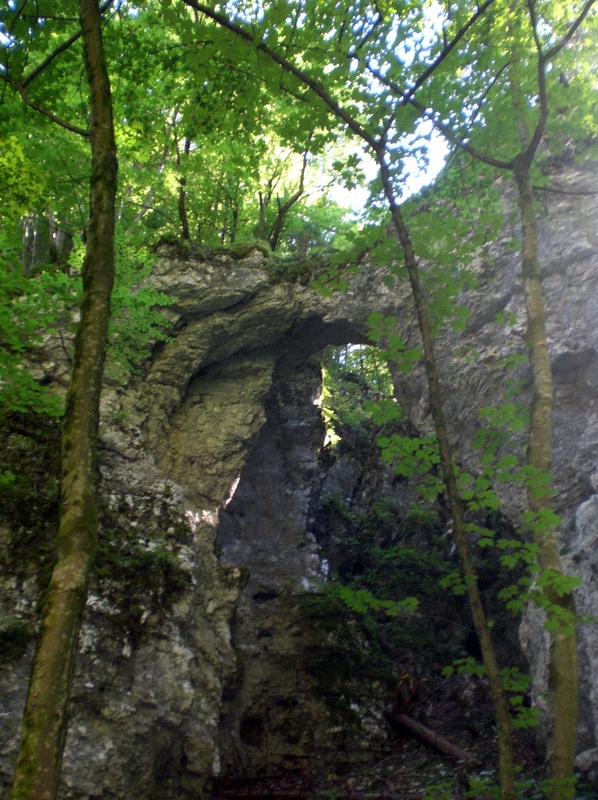 The 2km gorge was formed from the waters of the Pokljuka glacier. 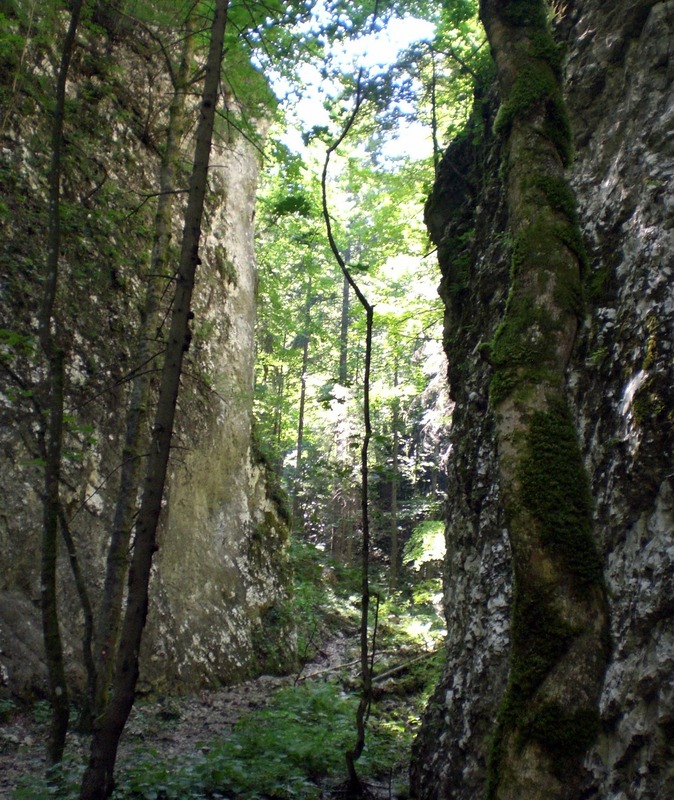 At first the terrain is a little difficult through a ravine with fallen trees, branches and stones, but as long as you are wearing good shoes it is fine and only takes around 20 minutes from the parking area to reach the most interesting part of the gorge. 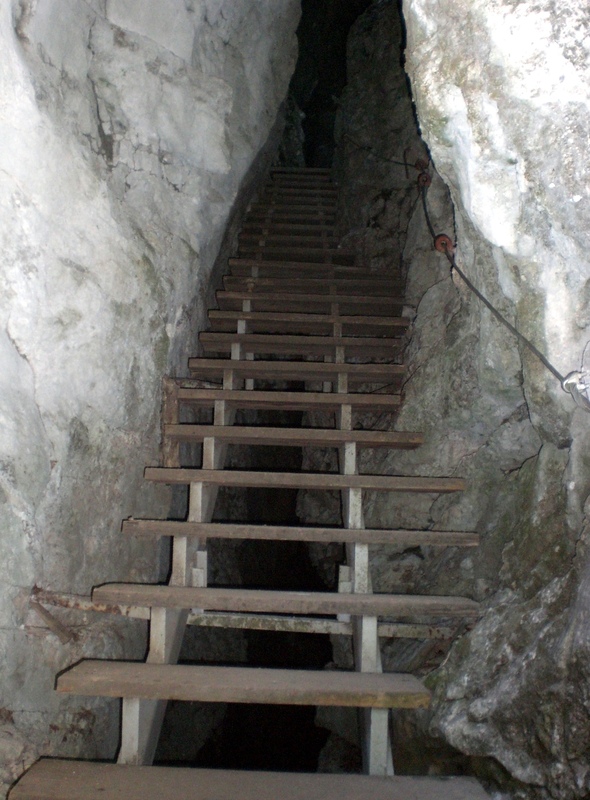 The path leads first past the natural bridge, then onto a large cave, the Pokljuka Hole. It then continues before reaching the Gallery, a wooden boardwalk, which leads up steps before you emerge from the rock walls into an area covered with ferns and forest flowers. This week I also visited the Pokljuka plateau itself, this time by bike. Its quite a long ride from Radovljica (496m), via Bled and Gorje, with an almost 900m altitude gain to reach Rudno Polje (1347m). The road climbs up gradually, via a series of sweeping bends, but its never overly steep. However, again its ideal in the heat as up there, on the forested plateau, the temperature was just perfect. The Pokljuka plateau is vast. 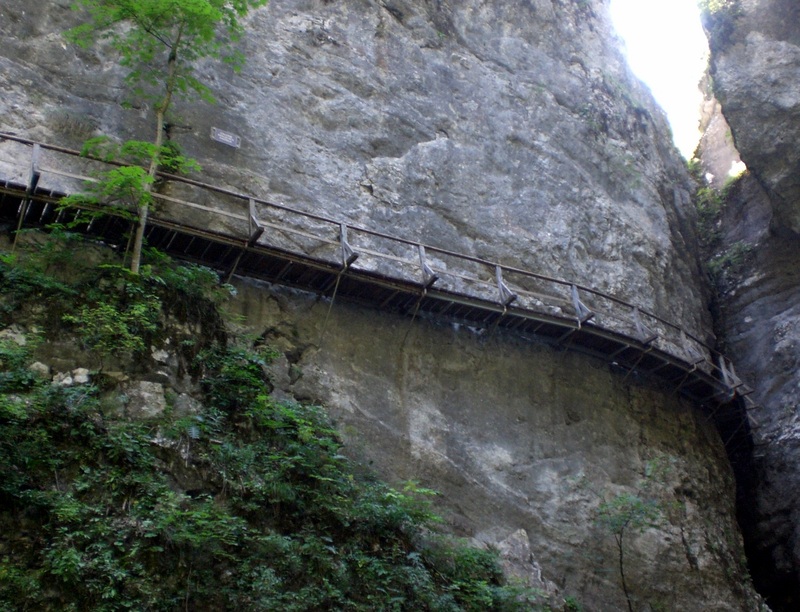 It spans almost 20km in both length and width and part of it lies within Triglav National Park. It is a popular destination for sports lovers; in winter it is home to some of the best country-country skiing trails in the area, and also the location of the annual Biathlon World Cup. There are also 2 small ski slopes, one near Rudno Polje and the other near the Sport Hotel. In summer, and in winter too, its a hikers paradise with a wide range of walks available from shorter strolls to one of its many highlands, to longer, more challenging walks to the surrounding mountains. The highest point, and a very popular spot year-round, is the peak of Debela Peč (2014m). Pokljuka is easiest accessed by car (or by bike!) as there is no public transport to/from the plateau other than in the summer months when buses run daily from Bled. As, more often than not, I’m walking alone, I don’t have the chance to get many pictures of me and the scenery (maybe that’s a bonus!). So here’s a picture taken by a friend who accompanied me this week for fantastic hike! 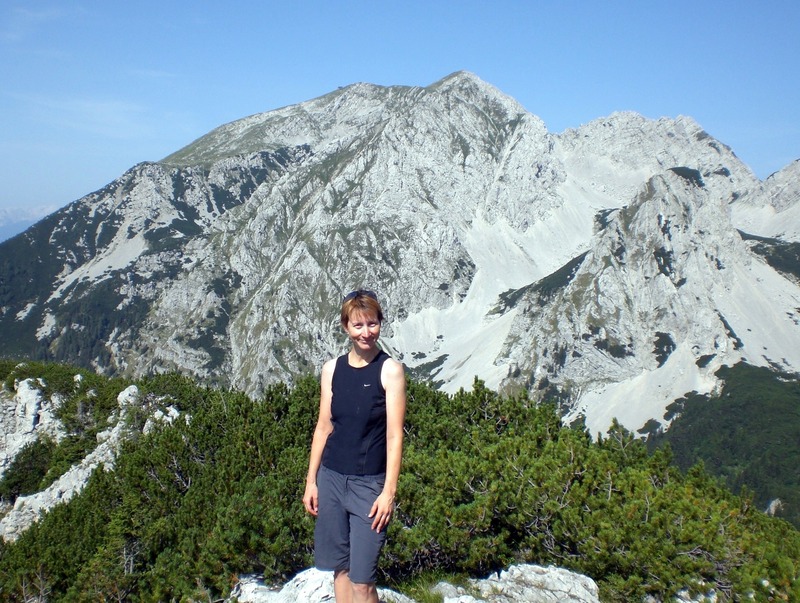 Here you can see me on the peak of Srednji vrh (1796m), on the left with Vrtača in the background and on the right with Stol behind me – super! This weekend it’s the Sheep Ball (Ovčji Bal) in Jezersko, so I hope to be making a visit there and writing more about the Jezersko area next week. The Ball, held annually on the second Sunday in August, celebrates the indigenous Jezersko-Solčava sheep breed and revives former traditions and customs. There is, of course, also an opportunity to buy and try all things ovine; local dairy products, wool products, souvenirs etc.